Crumble the salmon into a 1 quart bowl, removing any bones or skin. 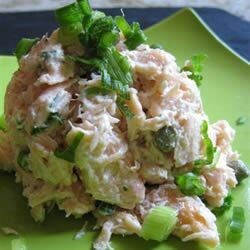 In a small bowl combine the mayonnaise, yogurt, celery, capers and pepper. Mix well and then add to salmon and toss. Serve on a bed of lettuce leaves. Subscribe to print any recipe now! Print as many recipes as you need and get a bonus by email!